imagine. what a captivating word. this go around, i was inspired by the beatles and paul McCartney himself. im not a crazy fan that knows every single song ever published, but i do have to give it up for the group themselves, for changing the way we see music forever. for this look i went ahead and combined a lot of symbolic pieces. dreamcatcher= dream. book=imagine the possibilities of life. the scarf= italy, adventure etc. they say once you turn 7 years old, your imagination starts to diminish but i wanted to go ahead and do a look where we can be inspired to bring it back to life. go for your dreams. don’t let anyone tell you that you can’t. just imagine. I love music of the Paul McCartney! I love your style! 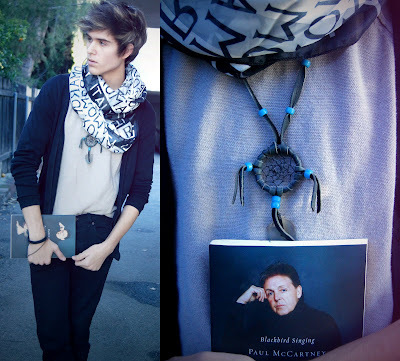 I posted a look its on my blog, you and your blog is perfect. Follow me ? love the scarf! i tried to find one like it…but without success! it’s not just your outfit, but also the photography and editing what makes me like them so much!